This recent project had environmental conditions that caused a phenomenon called thermal blindness that was the result of elevated relative humidity levels and little ventilation activity. 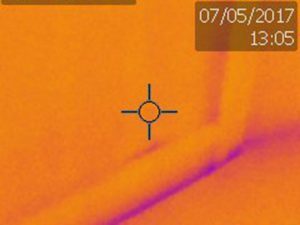 Once the conditions were adjusted to open a “thermal window” the little spot above the baseboard (below the cross-hair) was revealed, and this area was found to be water-saturated. Several areas such as this were identified in this basement suspected to be caused by foundation leaks. A strong moldy odor was also sensed in close proximity to the baseboards along the foundation walls. Our scientist isn’t afraid to get down on the floor and sniff the carpet or baseboards to check for odors – this is what we do and this kind of thoroughness is necessary to to give answers to solve our clients indoor air quality problems. July 2017 project.